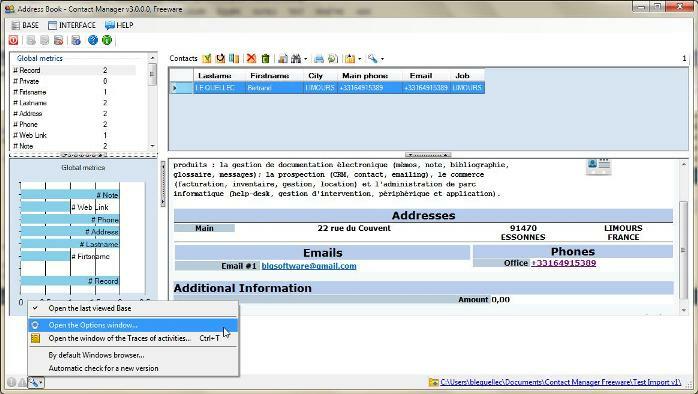 Contact Manager software is available in a Freeware edition, so free of charge and whose dissemination is free. Contact Manager freeware is free to download and use, but contains advertising (donate to remove it - no mimimum, pay as you want). Contact and Company management only (shareware edition allows more features). Organization through lists of Categories. Full description: photo, country, phones and multiple email, note, etc. Call with external integrated Windows software or Web Services. Sending email, display of the web site, etc. Data import/export formats: Microsoft Office Outlook, vCard and CSV/TSV. Plan showing the address on Google Maps. Presents direct access from an icon in the notification area. The setup software supports Windows 32-bit and 64-bit. It based on multilanguage Inno Setup free installer. There are two packages under versions of the Microsoft .NET Framework. Indeed, from Windows 7, only 4.6 of .NET Framework is supported. For Windows XP, official support stopped at version 4.0. NET. Freeware edition does not support .NET Framework 4.0. Cont@ct Manager Freeware (C@M) is free of charge. It is copyrighted software, not public domain software. All of the documentation and software included in the Contact Manager Freeware package is copyrighted by BLQ-software.